It all started last Thursday when I woke up. My throat was a little scratchy and my head hurt. Aspirin? No help. Chicken soup? Nope. Only when I logged into my trusty online sports book to put $20 on Belmont to cover the spread against Duke did I start to feel better. Unfortunately, much of Day 1 of the NCAA Tournament was uneventful and my temperature soared. With the lack of upsets, I had to pacify myself with a few games of online blackjack to get myself right. Friday morning? Even worse. With the games not beginning till mid-day, I felt like hell. Throbbing head, hives, double vision. Then something happened. I won $85 on slots before going 12-4 in my picks that day, capped by my pick of Cinderella Davidson. With each correct pick, my bracket looked better and I felt my strength returning. Yup. I’ve got a case of March Madness. 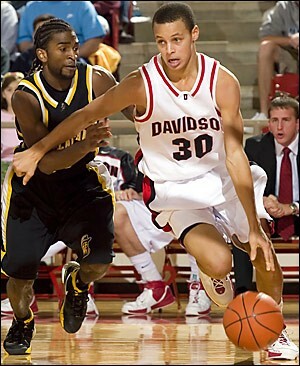 With Davidson’s Stephen Curry…who needs penicillin?